You’re just starting to wrap up four hours of web conferencing, when you suddenly feel that undeniable grumbling in your stomach. That hunger is making itself more pronounced as you reach for the phone to call your favorite Chinese takeaway place. And then you remember that you have strict orders from your doctor to keep your cholesterol levels down. Take consolation in the fact that even your favorite Chinese takeout restaurant has healthy alternatives. Instead of the usual fried and battered dishes, you can opt for the steamed variety. Order some steamed rice, fish, or dumplings. Plain noodles will go nicely with them. You can also get some meat soup to fill you up. Vegetable stir-fry is likewise a good choice. Just because you’re on some sort of diet, doesn’t mean you have to deprive yourself of accessible takeaway food. But if you really have time to cook, here’s an alternative to your take out dish – a healthy soup recipe you can do in a jiffy. If you are in a hurry to prepare lunch or dinner and you want to pair something soupy with your fried fish or chicken, you can try this meat soup recipe. 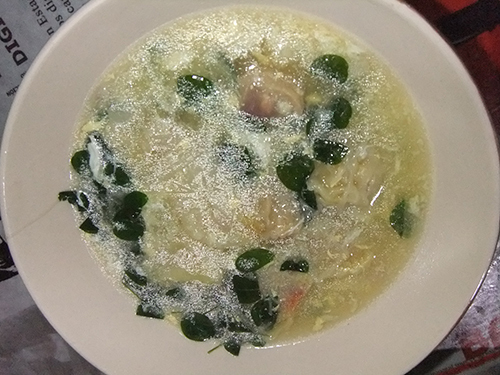 This entry was posted in Healthy food, Recipe, Sea Food and tagged healthy take out food, meat soup recipe, my simple misua soup, take away food, take out, take out dishes, take out food on January 13, 2016 by Yami.